This is the newest Novomatic slot in the series which includes: Simply Wild and Simply Wild Deluxe. It’s a fuss-free slot game with fruits and other traditional slot symbols. Any of these famous symbols can be a Wild symbol in Simply Wilder! That’s the fun of this game. Otherwise, it’s a pretty standard slot. 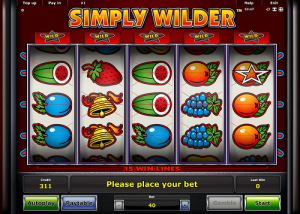 Simply Wilder is a slot game with 5 reels. There are 15 win lines in this slot and the RTP is 95%. The original Simply Wild has a much higher RTP so if you like this game, then you might want to think about playing that instead. In fact, Simply Wild (the original game in this series) has an RTP of 98% which is one of the highest percentages for any Novomatic slot. That’s not to say that Simply Wilder isn’t a good game to play. You can still get some really big wins, after all that’s why they call it online gambling! It’s always a risk and everything rests on the luck of the draw. Novomatic make many similar slot games. Simple is best! If a slot game is fancy but doesn’t pay then it’s just gimmicky! Some slots that bear a resemblance to Simply Wilder include: Wild Spinner, Mystery Star and Magic 27. None of the symbols in Simply Wilder are wild at all. You’ll have seen these symbols before, for sure! The plums, oranges, pears and bells all pay out x2 your bet. The strawberries, the watermelon, the grapes and the red seven all pay x4 your bet. The stars pay out 50x your bet! Any 3 of the same symbol gives the relevant payout, so long as they fall on a win line. There are 50 win lines in total and these pay one way: left to right. They only cover three reels each, so you can’t get a win for 4 matching symbols of 5 matching symbols. The first 5 win lines run across reels 1, 2 and 3. The second 5 win lines run across reels 2, 3 and 4. The last 5 win lines run across reels 3, 4 and 5. Any symbol in this slot game can become a Wild symbol. There are transparent stars that can turn up on any symbol and when this happens, that symbol will become a Wild symbol! Any symbol with a star on it can fill in for any other symbol in a winning combination! When you line up three of these symbols (any symbol with a star on it), you will be awarded the same win as if you lined up three star symbols! That’s 50x your bet per spin! As is the case with many other Novomatic slot games, Simply Wilder has two mundane features which you can use. Once you are happy with your bet, you can turn autoplay on and play without having to keep pressing the spin button! When you get payouts, after matching up three of the same symbol or three symbols with a star on, you can collect the payout or gamble it. You can possibly double your payout with this feature. In fact, if you win the gamble game, you could then double it again and again! You have a 50% chance every time you use it. Be aware, if you lose the gamble game at any point, you will lose your whole win! These two features are very typical of Novomatic slots and show up on most of their slots and video slots. Not all of Novomatic’s games are so simple and classic. Their most popular games are a little more unique and are based on many different themes! The most-played games from Novomatic include: Book of Ra, Ultra Hot Deluxe, Dolphin’s Pearl Deluxe, Lucky Lady’s Charm and Gold of Egypt.